With over 100+ golf courses to choose from for your next Myrtle Beach golf package, you will want to give Myrtle Beach golf Indian Wells Golf Course a look. This golf course is located on the south end and is a great course for golf groups as this Myrtle Beach golf course, Indian Wells is a great course for both men and women. With only a few forced carried shot and with the length of the course from the women’s tees Indian Wells makes for an enjoyable round for everyone with the ability to score well for everyone. Myrtle Beach golf Indian Wells golf course is a course that requires the ability to use all your clubs and make well thought out shots. Designed by Gene Hamm, built this par 72 course with US Open courses in mind. The greens are TifEagle Bermuda and while shaping the greens, the bunkers became a big focus for the designer. You will also notice that the shape of the holes are determined by the lining of the trees. 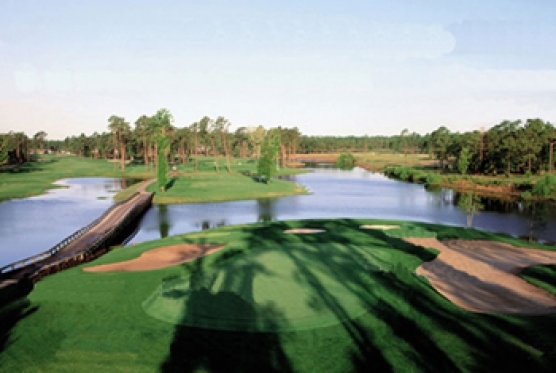 This Myrtle Beach golf course, Indian Wells, requires much thought in your shots with 14 water hazards and oddly placed oak trees – you’ll need careful shot selection for this challenging layout. The General Manager of this Myrtle Beach golf course, Indian Wells, feels like the course is fair to the average golfer. The need to hit the shot a long way is not needed on the course, rather a straight tee shot due to the tree lined fairways is more important. Hit the ball to the left or the right and you could be in for a long day. Some thought will be required on the doglegs as well as you’ll want to play your tee shot to an area that will leave you a good shot to the green. With the shorter length of this course, you can play well even if you strong shot isn’t your drive. Because there are several different ways of getting to the green, each shot can lead to tragedy or triumph.